Funko POP! figures are displayed during WonderCon 2016 at the Los Angeles Convention Center. The very first Funko Pop I ever bought was a Locutus of Borg figurine with a questionable paint job on its silvery armor that was meant as a birthday gift for my father. With my dad’s 60th birthday quickly approaching, I’m reminded that the tiny replica of Patrick Stewart has been sitting in my closet, undelivered, for years now. It’s not as if anything has happened to my father in the time since I bought the figure and now; he’s fine. I’ve just never been able to bring myself to wrap the thing, drop it in a box, and mail it to him because, on some level, I’ve been asking myself why I even bought the thing on a whim in a bookstore all those years ago. It’s only now that I think I’ve figured out why. Not long after I first bought the Locutus of Borg home, I slowly began picking up Funko Pops for myself after I began seeing characters from genre franchises I loved. First, a limited edition Garnet from Steven Universe, then Game of Thrones’ Daenerys in a flowing white gown, and then a Secret Wars-themed Miles Morales figure that you could only get through a monthly subscription box service. At first, there was no real rhyme or reason that dictated which Pops I collected beyond my simply liking a particular character, which made the subscription box seem like it might have been a good idea. But in time, something about the steadily-growing assembly of beady-eyed vinyl statues standing on my bookshelves began to bother me. Though I don’t really think of myself as much of a hoarder, I can sympathize with the impulse to collect things if only for the curiosity to see all of the little details that set all of the individual pieces of a larger collection apart from one another. To this day, a binder full of mint condition Pokémon cards I’ve had since the first grade is one of my most cherished possessions. But my nascent love affair with Funkos began to blossom, it just as quickly started to die as I considered just what exactly it was that I was getting out of them. The weird thing about Funko Pops is that, as seemingly unique as each figurine is, at the end of the day, they’re all based on a more or less standardized designed. Storm, Amy Winehouse, and American Horror Story’s Marie Laveau (portrayed by Queen Mother Angela Bassett) look nothing like one another, and yet their Funkos all do as a function of brand necessity. My collection of Funko Pops with special guest star Lego Constraction Captain Phasma. It’s that visual uniformity that made me contemplate what all the baubles really are and the answer I landed on was a rather sobering one. At the end of the day, Funkos (like all branded merchandise) are symbols, totems if you will, meant to represent the emotional relationships we all have to characters and stories that they love. Every time I look a make eye contact with the Garnet staring dead ahead through the plastic call of the box she came in, it brings me right back to the moment Ruby and Sapphire made their tearful, musical reunion aboard Peridot and Jasper’s spaceship in “Jail Break.” it brings me the kind of joy Marie Kondo would approve of. But as the number of Funkos I had increased, I had to ask myself: How much and what kind of joy is there to be had from trying to bank away an ever-expanding array of toys that, again, all look essentially alike? The fondness I feel for various television shows and movies isn’t dependent on the number of physical objects related to them that I can amass in my finite living space. But that’s kind of what Funko Pops are designed to be—statements to the world (or whoever sees them) about who you are as a fan. 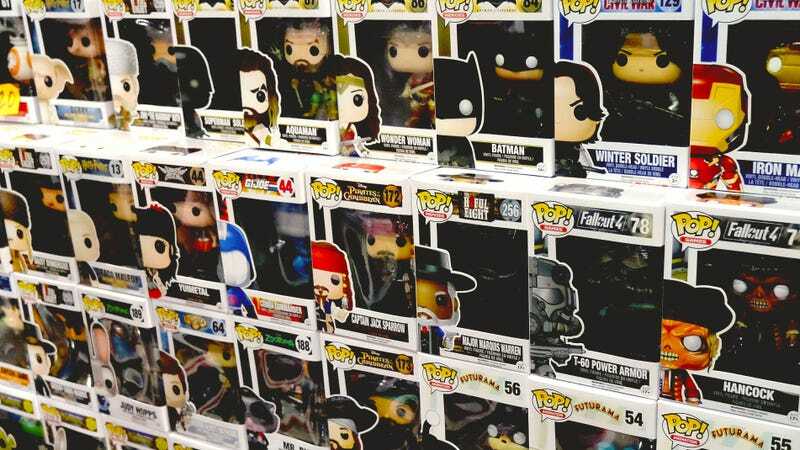 But there’s something about the very particular kind of mass-producedness that’s unique to Funko Pops that makes having too many of them feel strangely soulless to me. Seeing the sameness of them all is like seeing the broader commodification of fandom written in big bold letters across my wall. It’s made me become much, much more particular in general about the kinds of merchandise that I buy. I don’t subscribe to any genre-themed box services anymore, and many of the Funkos that once cluttered my apartment have been given away. But there are a few scattered about that have strong, positive memories attached to them. And they all remind me that I really need to get that Locutus of Borg to my old man.